2015 Product of the Year Now Available in a Disposable 10-Pack! NEW YORK--(BUSINESS WIRE)--Snackeez, the 2015 Product of the Year voted #1 kids novelty item in a survey of 40,000 consumers by TNS, has officially launched a new and breakthrough 2-in-1 snack and drink cup – Snackeez DUO! 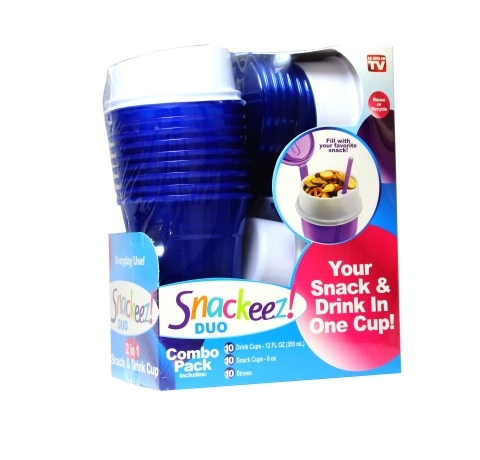 Snackeez DUO holds any 2 ounce drink in the cup while the 6-ounce snack bowl nests into the cup’s rim and snaps in place for a tight seal. The innovative snack and drink cup includes a straw, and a no-spill, flip-top snack bowl lid. Unlike the original Snackeez unit, DUOs are designed to be disposable but are sturdy enough that the most frugal can wash, dry, and reuse. They are BPA free and can be recycled. Snackeez DUOs are great for everyday use by kids and adults alike. Where they truly shine is in entertaining. The all-in-one recyclable container affords portability and convenience. They are a slam dunk for everything outdoor like barbeques, sports events, tail-gaiting and picnics, to indoor events like birthday parties, sleep-overs, poker games, bridge parties and more. Snackeez DUOs flip-top lid prevents dirt, bugs, and germs from getting into the snacks. But the standout here is that each cup can be personalized by writing your name on the rim in permanent marker. This ensures zero confusion as to which cup is yours! Snackeez DUOs come in a convenient 10-pack for $9.99. A 10-pack contains 10 cups, 10 bowls with lids, and 10 straws. Sold at Bed Bath & Beyond, CVS, Rite Aid, Walgreens, and Walmart. For more information visit www.snackeezduo.com. Ideavillage Products Corporation brings innovative products to market under the As Seen On TV banner, growing these items into brands. Headquartered in New Jersey, Ideavillage is dedicated to providing affordable, quality products that offer solutions to life’s everyday problems. Staying true to this simple business practice and employing national marketing and merchandising strategies, many products have catapulted to top performing brands. Having cultivated one of the largest retail distribution networks in the country, Ideavillage’s As Seen On TV products are available nationwide at various food, drug, and mass retail outlets, as well as direct to consumer.